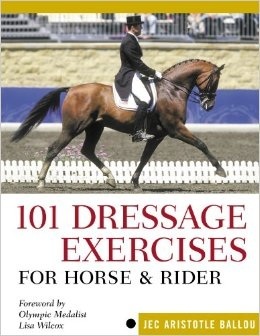 Jec Ballou, author of several books including “101 Dressage Exercises…” and “Equine Fitness” will be coming to the Christiane Noelting Dressage Center in Vacaville, CA. The clinic will include private lessons as well as a lunchtime lecture and a group lesson focusing on stretches and exercises you can do with your horse from the ground to improve his comfort and flexibility. Arena fee per horse ($30). No fee for CNDC boarders. Please contact Ellie right away to reserve your spot in the clinic. It is filling quickly and rider spots are limited. EllieDVM@hotmail.com or 707-761-5818. Jec’s lifelong study of classical dressage includes ten intensive training residencies in Portugal, two training residencies in Holland, and one residency in Germany with the late Egon von Neindorff. Most recently, she has studied in Melbourne, Australia with Manolo Mendez, original head rider of the Royal School of Equestrian Arts in Spain. She works tirelessly as an advocate for the understanding that proper biomechanical movement and athleticism can never happen as a result of short-cuts, force, or hurried training methods.